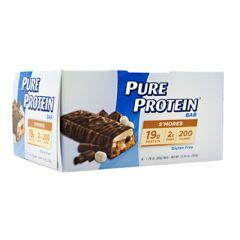 AllegroMedical.com presents The PURE PROTEIN Pure Protein Bar - S'mores Protein Bar Gluten Free. The S'mores high protein bar is delightfully delicious with fluffy marshmallow and creamy milk chocolate. It's packed with 19g of protein, ample vitamins and minerals to give your body what it needs...and deserves. S'mores is no longer just for campfires. Marshmallow Cream Layer (Maltitol Syrup, Milk Protein Concentrate, Palm Kernel Oil, Sorbitol, Nonfat Dry Milk, Soy Lecithin, Salt, Natural Flavors, Calcium Carbonate), Chocolate Flavored Coating (Maltitol, Fractionated Palm Kernel Oil, Whey Protein Concentrate, Cocoa [processed with alkali], Calcium Carbonate, Natural Flavors, Soy Lecithin, Sucralose), Hydrolyzed Collagen, Protein Blend (Whey Protein Isolate, Milk Protein Isolate, Whey Protein Concentrate), Glycerin, Soy Crisps (Soy Protein Isolate, Tapioca Starch, Soy Lecithin, Salt), Natural Flavors, Maltitol Syrup, Marshmallow Pieces (Sugar, Corn Starch, Fructose, Soy bean Oil, Corn Syrup Solids, Natural Flavors, Salt, Soy Lecithin), Water, Milk Chocolate Drops (Sugar, Whole Milk Powder, Chocolate Liquor, Cocoa Butter, Milk Fat, Soy Lecithin, Natural Vanilla Flavor), Soy Protein Isolate, Canola Oil, Calcium Carbonate, Vitamin and Mineral Blend (Ascorbic Acid, d-Alpha Tocopheryl Acetate, Niacinamide, Zinc Oxide, Biotin, Copper Gluconate, d-Calcium Pantothenate, Potassium Iodide, Vitamin A Palmitate, Tricalcium Phosphate, Pyridoxine Hydrochloride, Thiamin Mononitrate, Riboflavin, Folic Acid, Cyanocobalamin), Sucralose, Peanut Flour, Salt, Almond Butter, Soy Lecithin. Contains milk, soy, peanut, and tree nut (almond) ingredients.